Radio Transilvania interview with international adoptees Izidor Ruckel, Veronica Clark and Alex Kush in Cluj, Romania. "My goal in Romania is to create advocacy with citizens within the country. [Also,] the purpose for international adoption that I am personally fighting for is the children with special needs - those that cannot be adopted by Romanian families - should be available for international adoption." Listen to the entire interview on Radio Transilvania. 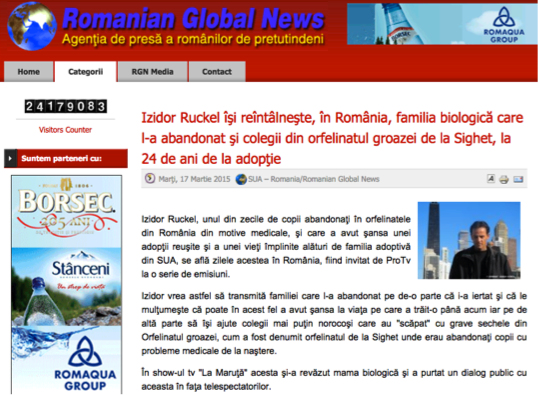 A Stirile TVR1 news story announcing Izidor and Alex Kush's speaking engagement in Brașov, Romania. 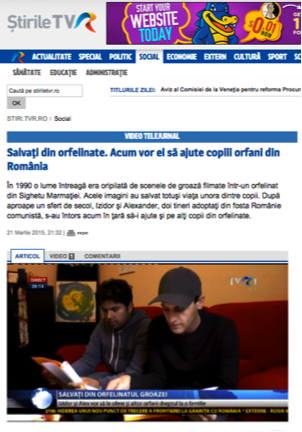 "...After nearly a quarter century, Isidor and Alexander, two young adopted from the former communist Romania, now returned to the country to help children in orphanages..."
Romanian Global News featured Izidor's spring 2015 trip to Romania and his efforts to help the country's orphans. 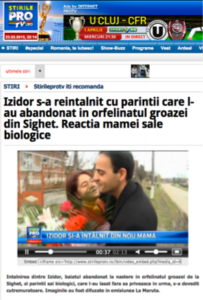 A Stirile ProTV news story featuring Izidor's return to Romania in March 2015 and reunion with his biological parents. "Izidor reunited with parents who abandoned him in an orphanage of horrors in Sighet. His biological mother's reaction..."